A conservation group is outraged at the seizure of what is believed to be the largest ever shipment of pangolin scales. Around 36,000 of the endangered mammals were killed for the shipment from Nigeria which was stopped in Singapore en route to Vietnam, which has the world’s second largest market for the scaly ant eaters. In a statement by Singapore customs, the shipment was declared to contain “frozen beef” but inspectors found 12.9 tonnes of pangolin scales, packed in 230 bags, worth about $38.7 million. The shipment also included 177 kilograms of cut up and carved elephant ivory estimated to be worth $88,500. Pangolins are thought to be the most widely illegally trafficked mammal in the world, with the biggest market being China where its meat is valued for the status it gives and the health benefits people believe it can offer. Consumers believe that it can help with skin diseases and conditions such as rheumatism. The group Conservation of Nature says all eight species are at threat of extinction, while two species are critically endangered. There are no details yet of any arrests. The maximum penalty for the illegal import, export and re-export of wildlife is a fine of up to $500,000 and/or two years’ jail, Singapore customs said in the statement. There have been a number of high profile seizures of the animal recently. 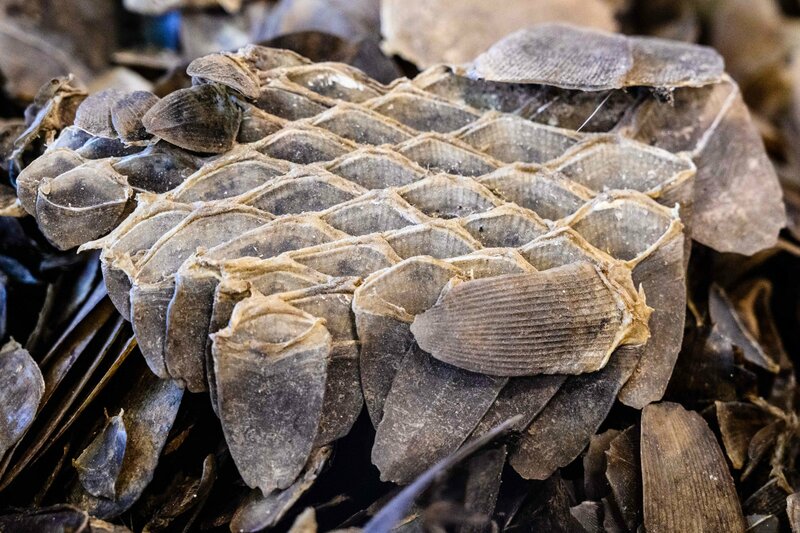 In January, authorities in Hong Kong seized 8.3 tons of pangolin scales, from about 13,800 animals, in a shipment bound from Nigeria to Vietnam. In February, 33 tons of pangolin meat was seized at processing facilities in Malaysia, the wildlife website Traffic reported. Earlier that month, Hong Kong authorities intercepted a nine-ton shipment of pangolin scales and a thousand elephant tusks. Living on a diet of ants and termites, the animals have the nickname “scaly anteater” and when they are faced with danger, they curl up in a ball, making them easy prey for hunters. A ban on global trade in all pangolin species was introduced in 2016, but it has not been enough to stem the demand for these shy animals. Unlike the poaching of elephants and rhinos for their tusks and horns, the hunting of pangolins is still not widely known. As World Pangolin Day provides “an opportunity for pangolin enthusiasts to join together in raising awareness about these unique mammals”, WWF has conducted a study to establish the level of pangolin knowledge among the British public. One of the great tragedies of the global pangolin crisis is that so little is known about these elusive animals. Most are nocturnal and live in trees, and there is relatively poor data on total numbers worldwide. “In October the UK will host a major conference on the illegal wildlife trade, a hugely important event where we hope to see global leaders make strong commitments to put an end to wildlife crime once and for all,” said Dr O’ Criodain.